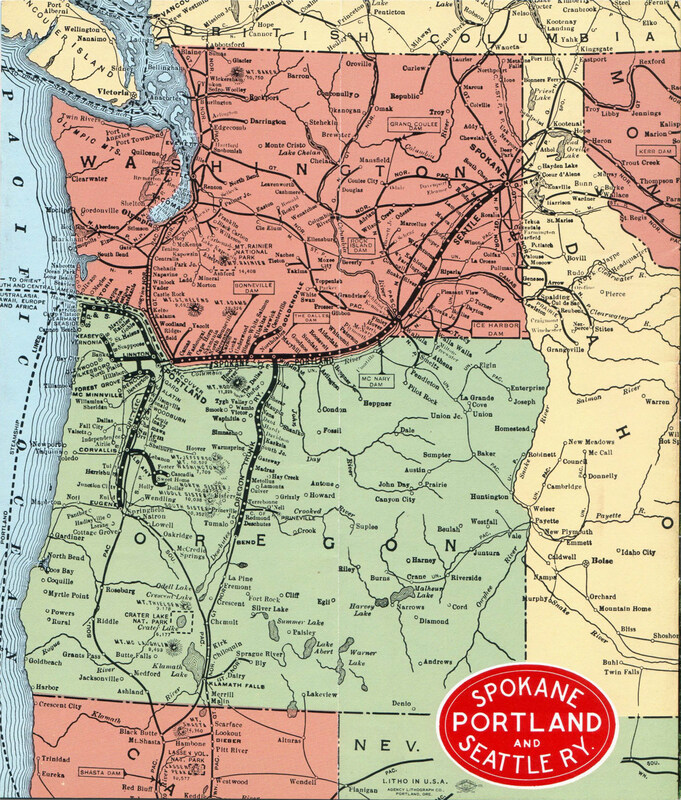 The Spokane, Portland and Seattle Railway was constructed solely as a direct link into Portland, Oregon for the Northern Pacific and Great Northern. It was never intended to maintain a long-term identity but soldiered on for nearly seven decades after numerous attempts to merge the so-called "Hill Lines" failed. The SP&S was built at a relatively late date, delayed largely to ongoing disputes with Union Pacific and its subsidiary, the Oregon Railway & Navigation Company. After persistent legal battles regarding access into Portland and ownership of the mighty Columbia River's north bank, SP&S's 379.5-mile main line was finally completed in 1909. "The Northwest's Own Railway" (also known as the "North Bank Road") was the great James J. Hill's most famous project within the Pacific Northwest as he worked to establish a dominating presence to garner as much freight and passenger business as possible. 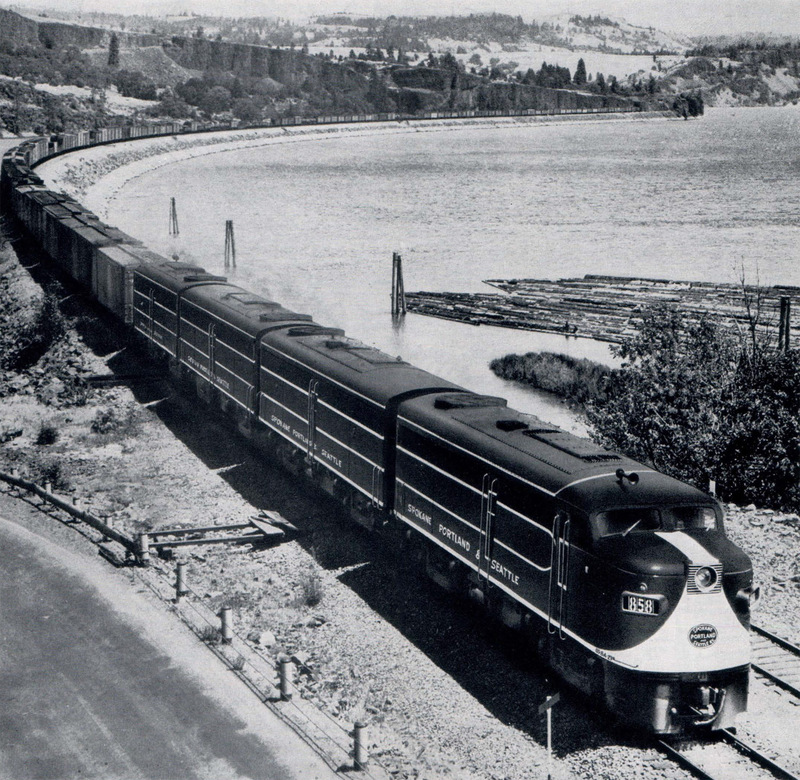 The Chicago, Milwaukee, St. Paul & Pacific's ("The Milwaukee Road") failure to do so was one reason for its Pacific Extension's early struggles. The SP&S did well as a bridge road for more than 60 years until the long sought merger finally occurred in 1970 and it disappeared into Burlington Northern, Inc.
James Hill was one of the most successful tycoons of railroad's "Golden Age." Unlike some moguls, who simply grabbed companies to spread their influence, the "Empire Builder" maintained a steadfast approach with his Great Northern Railway by focusing on two principal areas; connecting Chicago with the Puget Sound and growing traffic density. In doing so he pieced together one of America's great railroads. In 1893 the GN was completed between the Twin Cities and Seattle; only a few years later (1901), he added the Chicago, Burlington & Quincy to reach Chicago. During this time he also picked up one-time rival Northern Pacific (1900). Hill increased freight business in a number of ways, such as acquiring small feeder lines or building branches but his greatest achievement was building the Spokane, Portland & Seattle Railway. According to the book "The Great Northern Railway, A History" by authors Ralph W. Hidy, Muriel E. Hidy, Roy V. Scott, and Don L. Hofsommer, he believed that doing so was the only way to effectively sustain long-term success. The NP was the first to reach the Pacific Northwest but originally did so only over Henry Villard's Oregon Railway & Navigation Company. 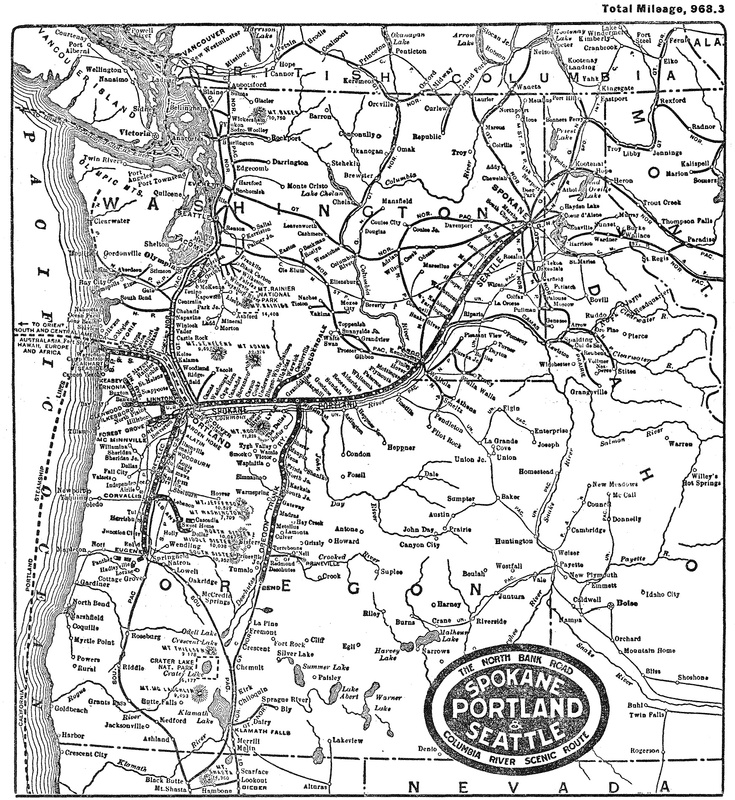 In 1888 it completed its own route into Seattle/Tacoma but then lost the direct Portland connection after Villard resigned NP's presidency in 1884 (the OR&N would wind up under rival Union Pacific's control by 1887). The NP still enjoyed access into the city but only using a roundabout, non-competitive routing via Tacoma. When James Hill took command he immediately recognized this problem. To remedy the issue he eyed a corridor along the Columbia River's northern periphery which would essentially parallel Union Pacific's OR&N occupying the south bank. The earliest heritage of a transportation route along the river's northern shore can be traced back to a tramway built by F.A. Chenowith in 1851 (this system later became part of the OR&N). In 1880, the Northern Pacific seriously considered building on the Washington-side of the river, and even completed some grading work near The Dalles before Villard convinced the company to utilize his railroad instead. Next was the The Farmer's Railway, Navigation & Steamboat Portage Company (first to carry any association with the modern SP&S) incorporated on December 9, 1885 for the purpose of connecting The Dalles and Celilo Falls to aid water navigation along this dangerous area of the river. "As the line would furnish access to Portland for both the Northern Pacific and Great Northern, it has been determined to build the line through an independent company, the bonds of which will be guaranteed by the Northern Pacific and Great Northern and the stock equally divided between the two companies. The Great Northern can turn its business over to the Northern Pacific at Spokane, or they can build from a convenient point west of Spokane down to a connection with the Northern Pacific at or near Ritzville. The main object of having the line owned equally and jointly from Pasco to Portland is to preserve for each company independent rights through that territory, and, while taking possession of the north shore of the Columbia River, avoiding the necessity of any duplication of mileage thereafter." And so, on August 22, 1905 the Portland & Seattle Railway was incorporated, acquiring the old CR&N's assets as well as the Columbia River & Northern, a Northern Pacific property running between Lyle and Goldendale (it later served as an SP&S branch). The P&S would construct a line from Vancouver (near Portland) to Kennewick, establishing connections with the NP at both points. After a long drawn out fight with the OR&N, the P&S was well underway by January of 1906 when some 1,700 men and 400 horse/mule teams were at work grading right-of-way. Later that summer, Hill slightly amended the eastern terminus by deciding upon a northern extension into Spokane, thereby providing for direct service from eastern Washington. With this change the company's name was changed to the Spokane, Portland & Seattle Railway on February 1, 1908. By then, the Kennewick-Vancouver segment was rapidly nearing completion as crews from the east and west hurriedly worked from both directions. They finally met on the night of February 22, 1908 amid little fanfare. However, the city of Vancouver, eagerly interested in marking the event, held a "Golden Spike Ceremony at Milepost 50.5, complete with an excursion, on March 11th. Oriental Limited: GN's train which connected Chicago to Portland, via the SP&S between Spokane and Portland. Mainstreeter: NP's train which connected Portland to Chicago, via the SP&S between Spokane and Portland. Western Star: GN's train which connected Portland to Chicago, via the SP&S between Spokane and Portland. Afterwards, work commenced that spring on the northern section from the NP connection at Pasco/Kennewick. It ran along the Snake River as far as Devils Canyon, then veered away due north to Kahlotus and Spokane. The Pasco-Marshall section was officially completed on February 4, 1909; beyond Marshall, SP&S would utilize Northern Pacific trackage to reach NP's passenger station and freight terminal on Spokane Street. With this, the Spokane, Portland & Seattle was complete although at a cost far higher than originally projected; engineers had pegged the Kennewick-Vancouver section at only $7.3 million and the Pasco/Kennewick-Marshall/Spokane segment $8.6 million. In the end, the entire affair cost nearly $60 million. Despite this steep price it proved a worthwhile venture affording NP and GN many new opportunities. After completion, Hill added a handful of branches to increase the road's freight tonnage including the Astoria & Columbia River Railroad in March of 1907 (later known as the "Astoria Line" it served Goble and Seaside, reaching Portland thanks to trackage rights over the NP east of Goble), United Railways, and the Oregon Electric Railway. The latter two properties joined the SP&S in 1910 and were built as electrified interurbans. As Dr. George Hilton and John Due's authoritative piece, "The Electric Interurban Railways In America," point out, Hill was particularly interested in their timber traffic. Oregon Electric: The history of the Oregon Electric begins in 1905 when the Willamette Valley Traction Company was chartered to construct a route along the west and east sides of the Willamette River from Portland to Salem (a distance of around 47 miles). On January 1, 1908 the WVTC opened its main line between Portland and Salem and was soon renamed as the Oregon Electric Railway. For the rest of that year, and through 1909, additional extensions reached Forest Grove (west of Portland) and Woodburn. From the beginning, it was owned and financed by the W.S. Barstow & Company but after just two years, and before any further construction, it was acquired by the Great Northern in 1910 and handed over to subsidiary Spokane, Portland & Seattle Railway. Afterwards, service was extended as far as Eugene on October 17, 1912. It also maintained a handful of branches to Forest Grove (1908), Woodburn (1909), Corvallis (March 25, 1913), and Dollar/Forest. In total, the OE boasted a system stretching more than 190 miles. While it offered high-speed and frequent passenger service the company enjoyed strong freight business right from the start. For instance, in 1932 passenger earnings contributed only 6.5% of total revenues. It was seriously affected by the automobile's rise and abandoned all passenger service in 1933. In 1945 electrics were dropped in favor of diesels. United Railways: The United Railways (UR) was incorporated in 1906, acquiring the assets of the yet-to-be-built Oregon Traction which was projected to link downtown Portland at 2nd and Stark Streets with Hillsboro. The latter point was never reached although on April 16, 1911 UR opened 28 miles to Wilkesboro and Banks, which included a 4,100-foot tunnel beneath Cornelius Pass. It was intended to reach the coast at Tillamook but ultimately this endeavor also failed. The company did grow further when, in 1922, it picked up the Portland, Astoria & Pacific, which extended service to Vernonia. A year later electrified passenger service ended as the company focused primarily on its freight business. All passenger operations ceased in 1934 and UR was fully merged into the SP&S in 1943. 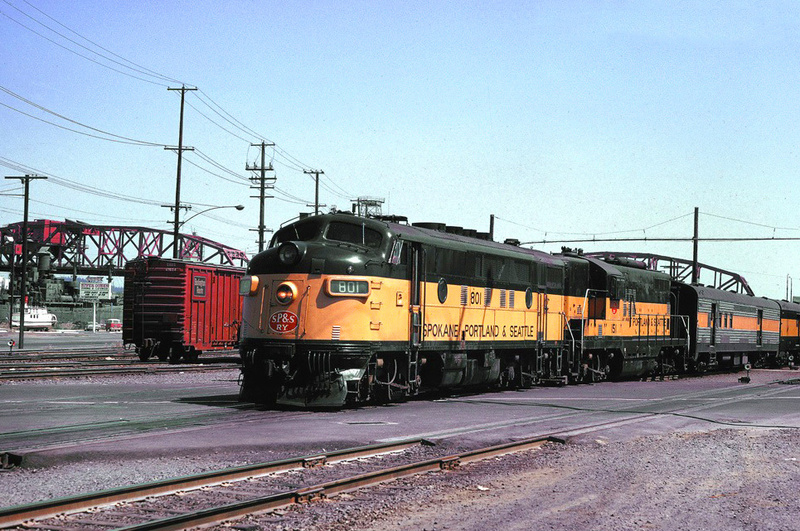 While the SP&S operated less than 1,000 route miles it proved a key link to the future Burlington Northern, and later BNSF Railway empires. One of its final noteworthy infrastructure projects was assisting in the Great Northern's extensions south through Oregon. Hill continued his escapades into the Beaver State by picking up the Oregon Trunk Railway in August of 1909. This small system extended from Wishram (formerly Fallbridge), along the SP&S, to Bend when it opened on November 1, 1911. There would be further extensions here albeit not until after Hill's passing. To make a connection with the SP&S required crossing the mighty Columbia River. To do this, the Oregon Trunk Rail Bridge, or Celilo Bridge, was completed in January, 1912. Designed by engineer Ralph Modjeski, and constructed by the Missouri Valley Bridge & Iron Company of Leavenworth, Kansas, the structure carried a total length of 2,396 feet. In addition, there were a pair of wyes along the north bank; the eastern leg of which was 952 feet long while the western leg was 849 feet long. The line to Bend was later extended to Bieber, California, opening in September of 1931, which offered a connection to the Western Pacific from its main line at Keddie, California. What was known as the "Inside Gateway," provided both railroads (and the Santa Fe) a lucrative partnership of handling traffic from Oakland/San Francisco to Chicago in competition against Southern Pacific. 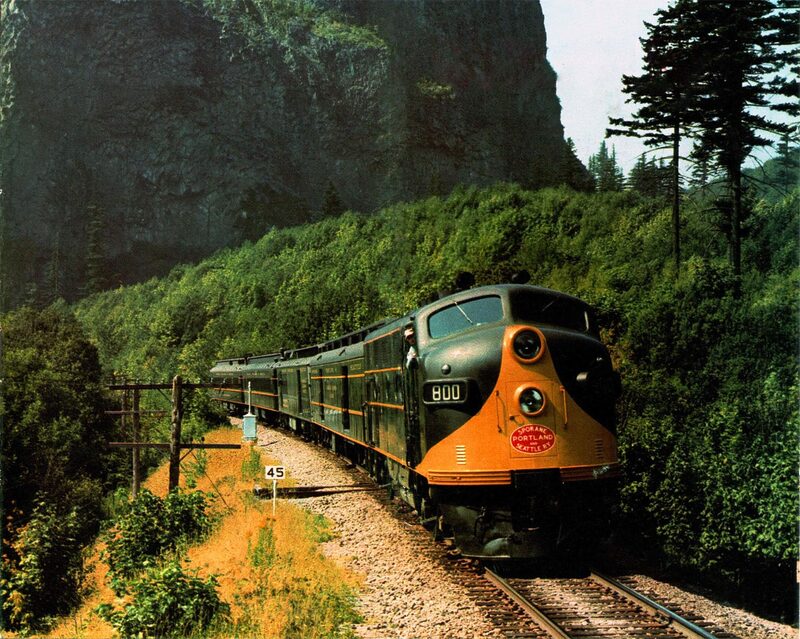 Along with its freight business, SP&S handled a number of important passenger trains, such Northern Pacific's premier North Coast Limited and Great Northern's fabled Empire Builder. 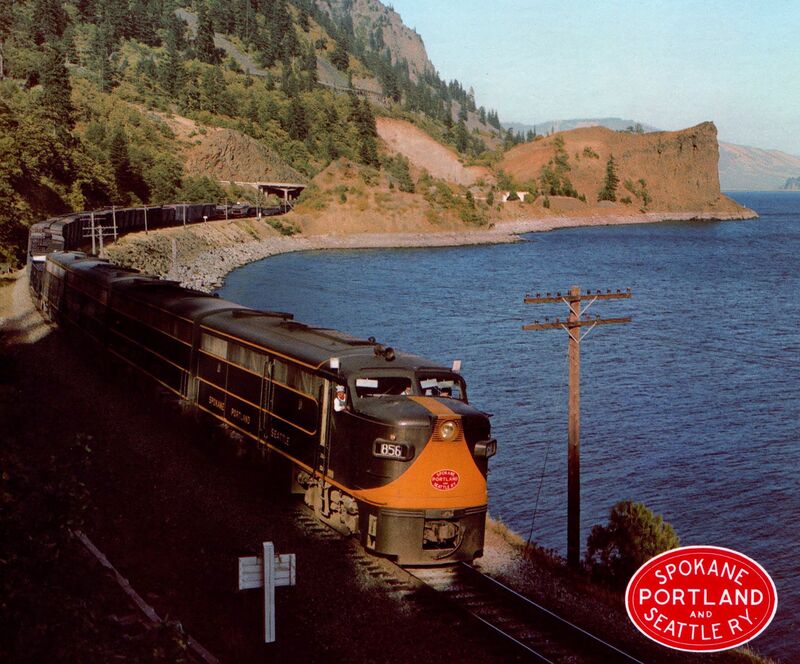 It also operated its own daytime service between Portland and Spokane, the all-stops Columbia River Express. From an equipment standpoint, the SP&S was treated mostly like an unwanted step-child. For instance, obtaining needed freight cars was sometimes very difficult and it usually operated with used locomotives of Great Northern and Northern Pacific lineage. It received its first modern motive power in 1937 when it was assigned six new 4-6-6-4's from a Northern Pacific batch of twenty-one ordered from Alco. Later, in the 1940s, it received new diesels from Electro-Motive and American Locomotive. 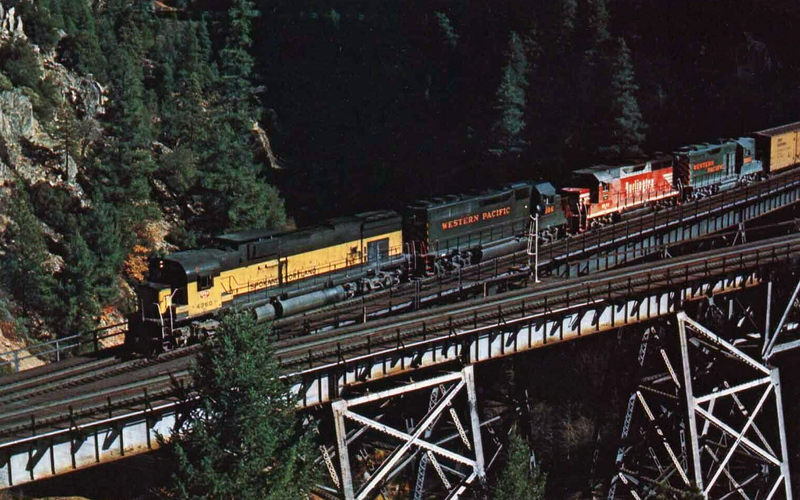 The Alco's were especially memorable, as fleets of Century 424's, 425's and 636's along with FA-1/2's could regularly be witnessed ahead of freight trains. According to Mike Schafer's book, "Classic American Railroads: Volume III," the last steam locomotive to operate was 4-6-6-4 #910 on June 23, 1956. While the SP&S's life was, perhaps, not as interesting or long-lived as other classic fallen flags, its lines were key routes to points like Seattle, Portland and northwestern Oregon. Its main line continues to serve as an important artery under BNSF Railway today.